For other uses, see Wavelength (disambiguation). for θ being the half-angle of the cone of rays accepted by the microscope objective. ^ Hecht, Eugene (1987). Optics (2nd ed.). Addison Wesley. pp. 15–16. ISBN 0-201-11609-X. ^ Brian Hilton Flowers (2000). "§21.2 Periodic functions". An introduction to numerical methods in C++ (2nd ed.). Cambridge University Press. p. 473. ISBN 0-19-850693-7. ^ Raymond A. Serway; John W. Jewett (2006). Principles of physics (4th ed.). Cengage Learning. pp. 404, 440. ISBN 0-534-49143-X. ^ A. A. Sonin (1995). The surface physics of liquid crystals. Taylor & Francis. p. 17. ISBN 2-88124-995-7. ^ Keqian Zhang & Dejie Li (2007). Electromagnetic Theory for Microwaves and Optoelectronics. Springer. p. 533. ISBN 978-3-540-74295-1. ^ Theo Koupelis & Karl F. Kuhn (2007). In Quest of the Universe. Jones & Bartlett Publishers. ISBN 0-7637-4387-9. ^ Paul R Pinet (2008). Invitation to Oceanography (5th ed.). Jones & Bartlett Publishers. p. 237. ISBN 0-7637-5993-7. ^ David C. Cassidy; Gerald James Holton; Floyd James Rutherford (2002). Understanding physics. Birkhäuser. pp. 339 ff. ISBN 0-387-98756-8. ^ John Avison (1999). The World of Physics. Nelson Thornes. p. 460. ISBN 978-0-17-438733-6. ^ To aid imagination, this bending of the wave often is compared to the analogy of a column of marching soldiers crossing from solid ground into mud. See, for example, Raymond T. Pierrehumbert (2010). Principles of Planetary Climate. Cambridge University Press. p. 327. ISBN 0-521-86556-5. ^ a b Paul R Pinet (2009). op. cit. p. 242. ISBN 0-7637-5993-7. ^ Bishwanath Chakraborty (2007). Principles of Plasma Mechanics. New Age International. p. 454. ISBN 978-81-224-1446-2. ^ Jeffrey A. Hogan & Joseph D. Lakey (2005). Time-frequency and time-scale methods: adaptive decompositions, uncertainty principles, and sampling. Birkhäuser. p. 348. ISBN 978-0-8176-4276-1. ^ See Figure 4.20 in A. Putnis (1992). Introduction to mineral sciences. Cambridge University Press. p. 97. ISBN 0-521-42947-1. and Figure 2.3 in Martin T. Dove (1993). Introduction to lattice dynamics (4th ed.). Cambridge University Press. p. 22. ISBN 0-521-39293-4. ^ Manijeh Razeghi (2006). Fundamentals of solid state engineering (2nd ed.). Birkhäuser. pp. 165 ff. ISBN 0-387-28152-5. ^ See Lord Rayleigh (1890). "Wave theory". Encyclopædia Britannica (9th ed.). The Henry G Allen Company. p. 422. ^ Valery N. Pilipchuk (2010). 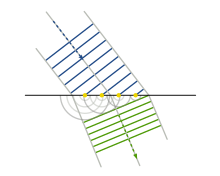 "Figure 4.4: Transition from quasi-harmonic to cnoidal wave". Nonlinear Dynamics: Between Linear and Impact Limits. Springer. p. 127. ISBN 3642127983. ^ Andrei Ludu (2012). "§18.3 Special functions". Nonlinear Waves and Solitons on Contours and Closed Surfaces (2nd ed.). Springer. pp. 469 ff. ISBN 3642228941. ^ Alfred Osborne (2010). "Chapter 1: Brief history and overview of nonlinear water waves". Nonlinear Ocean Waves and the Inverse Scattering Transform. Academic Press. pp. 3 ff. ISBN 0-12-528629-5. ^ Alexander McPherson (2009). "Waves and their properties". Introduction to Macromolecular Crystallography (2 ed.). Wiley. p. 77. ISBN 0-470-18590-2. ^ Eric Stade (2011). Fourier Analysis. John Wiley & Sons. p. 1. ISBN 1-118-16551-9. ^ Peter R. Holland (1995). The Quantum Theory of Motion: An Account of the de Broglie–Bohm Causal Interpretation of Quantum Mechanics. Cambridge University Press. p. 160. ISBN 978-0-521-48543-2. ^ Jeffery Cooper (1998). Introduction to partial differential equations with MATLAB. Springer. p. 272. ISBN 0-8176-3967-5. 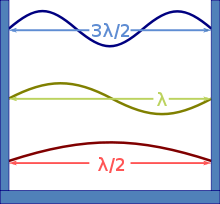 The local wavelength λ of a dispersing wave is twice the distance between two successive zeros. 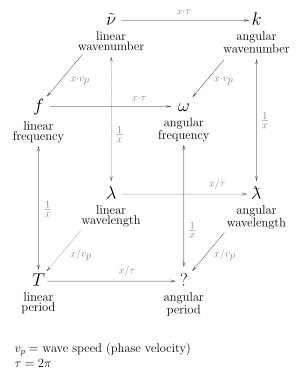 ... the local wavelength and the local wave number k are related by k = 2π / λ. ^ a b See, for example, Figs. 2.8–2.10 in Joy Manners (2000). "Heisenberg's uncertainty principle". Quantum Physics: An Introduction. CRC Press. pp. 53–56. ISBN 978-0-7503-0720-8. ^ Ming Chiang Li (1980). "Electron Interference". In L. Marton; Claire Marton (eds.). Advances in Electronics and Electron Physics. 53. Academic Press. p. 271. ISBN 0-12-014653-3. ^ Greenfield Sluder & David E. Wolf (2007). "IV. 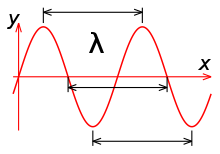 Young's Experiment: Two-Slit Interference". Digital microscopy (3rd ed.). Academic Press. p. 15. ISBN 0-12-374025-8. ^ Kordt Griepenkerl (2002). "§9.8.2 Diffraction by a grating". In John W Harris; Walter Benenson; Horst Stöcker; Holger Lutz (eds.). Handbook of physics. Springer. pp. 307 ff. ISBN 0-387-95269-1. ^ Douglas B. Murphy (2002). Fundamentals of light microscopy and electronic imaging. Wiley/IEEE. p. 64. ISBN 0-471-23429-X. ^ John C. Stover (1995). Optical scattering: measurement and analysis (2nd ed.). SPIE Press. p. 64. ISBN 978-0-8194-1934-7. ^ Graham Saxby (2002). "Diffraction limitation". The science of imaging. CRC Press. p. 57. ISBN 0-7503-0734-X. ^ Grant R. Fowles (1989). Introduction to Modern Optics. Courier Dover Publications. pp. 117–120. ISBN 978-0-486-65957-2. ^ James B. Pawley (1995). Handbook of biological confocal microscopy (2nd ed.). Springer. p. 112. ISBN 978-0-306-44826-3. ^ Ray N. Wilson (2004). Reflecting Telescope Optics I: Basic Design Theory and Its Historical Development. Springer. p. 302. ISBN 978-3-540-40106-3.